Source: "Some South African Flags, 1940-1990" compiled by F.G. Brownell, the State Herald, June 1991. (SAVA Journal 1/92) [brl92]. image from Mike Oettle's website. The actual arms of the Orange Free State republic were quite different, as you'll see at my website. Arms: On a shield Argent, between three bugle horns Azure, garnished and stringed Gules, a representation of the seal of the Orange Free State Republic as adopted in 1856, viz. 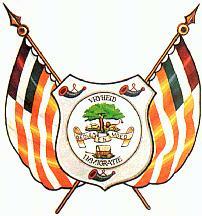 on a white roundel, in chief a tree on an island, between dexter, three sheep and sinister, a natural lion supporting the tree with his dexter paw, in base a Voortrekker wagon on an island all proper; on a ribbon draped fesswise, the motto GEDULD EN MOED, above the tree the word VRYHEID and below the wagon the word IMMIGRATIE; behind the shield on two staves in saltire with ball and spear point Or, two flags of the same Republic draped on both sides, each with seven stripes visible, alternately white and orange and a canton of three stripes, red, white and blue. The story of how the OFS got its odd concoction of a coat of arms was especially interesting to me, since it involved a tricky situation that my ancestor President Boshof had to deal with. You'll see on my page an illustration of one of the drafts put forward to the Dutch king for his grant to the Boer republic. I hope to have a second illustration, of a rather different draft design, on the page early next year. I found interesting Coat of Arms for the Orange Free State. Why the flags which decorated the shield are 'Vierkleur' of South African Republic? Why not Orange striped Flags? That's a curious coat of arms you illustrate for the Oranje Vrijstaat. It's certainly irregular, and it seems to me to have been concocted by some European supporter of the Boer republics during the South African War. I did try to find the website where the odd illustration came from, but the URL seems to have changed or been cancelled.